Season 2004-05 was a disappointing one and the close season sparked a mass exodus of players from the club. Captain Neil Ewart, along with midfielders Darren Lockhart and Mel Graham moved to Civil Service Strollers, while twins Craig and Gary Lothian, as expected, were signed up by father Fraser to boost Selkirk’s promotion push, where they were joined by striker Gary Hastie. Also departing were Steven Noble, Des Sutherland and Scott McKenzie, all of whom chose to drop back to Border Amateur League level with Gala Rovers. There was no change of personnel in the dugout, but Stuart Robertson was now co-manager alongside George Watson, who stepped up from coach as Jack Diamond took a less active role due to increasing work commitments. It was Watson who was responsible for bringing in the vast majority of the new players as he raided old club Newtongrange Star for Mark Brown, Colin Garvie, Rory Mair, Ross McManus and Fleming brothers Raymond and Ronald. Also joining up were Scott Johnston, Michael MacKale and Lewis Montgomery from Loanhead MW, while former Edinburgh City U-21 players Craig Dickson and Graeme Markham added their talents. The only players remaining from the previous campaign were the long-serving Robbie Clark who was appointed captain, Chris Cassidy and goalkeeper Iain Gordon. The Vale line-up that kicked off the opening pre-season game against Border Amateur League side Pencaitland featured several trialists, including Danny Swanson from Leith Athletic, who went on to accept an offer from SFL side Berwick Rangers, where he eventually became a team mate of ex-Vale star Sean Paliczka, who moved from East Fife during the January transfer window. A meeting with crack junior outfit Haddington Athletic and a good 2-0 victory over Edinburgh University apart, pre-season contained little action against quality opposition, so it was anybody’s guess how the young squad were going to cope with the rigours of senior football. A handy introduction came in the shape of a change to the structure of the League Cup, which for the first time since season 1999-2000 was played at the beginning of the season in a sectional format, albeit with each team now only playing each other once. It was a steep learning curve as Vale ended up rooted to the bottom of their section after three defeats. A 3-1 reverse at Hawick Royal Albert saw all the goals come in the last five minutes of the game, while a midweek meeting with Easthouses Lily at Victoria Park saw Vale lose by the same scoreline, but more comprehensively than it suggested. With Vale out of the competition, the final group game against Edinburgh University saw the students needing to win by a two-goal margin to qualify for the quarter finals and it turned out to be an eventful game for all the wrong reasons. After a bright start to the game, Vale found themselves down to ten men in the 36th minute as Lewis Montgomery was controversially shown a straight red card for a tackle on ‘Burgh’s Jack Beesley. He was immediately followed to the Peffermill pavilion by co-manager George Watson for the manner in which he disputed the decision. Fifteen minutes from the end, there was more controversy when University’s Nicky Walker was played in while in what looked like an offside position and ran on to score. The goal incensed coach Jack Diamond, who joined the growing Vale contingent in the dressing rooms for foul and abusive language. Five minutes later they had more company as Raymond Fleming, who had been cautioned in the first half for dissent, picked up a second yellow card for kicking the ball away. The result meant that Edinburgh University and Easthouses Lily finished with identical records and had to enter into a specially arranged play-off to determine the group winners. The draw for the Scottish Qualifying Cup could scarcely have been tougher – a Preliminary Round meeting against holders Whitehill Welfare at Victoria Park. In front of a large crowd including SFA Chief Executive David Taylor, underdogs Vale gave a superb team performance, with Mark Brown’s goal ten minutes from time enough to defeat Whitehill, whose manager John Clark resigned after the game. After having done the hard bit, Vale crashed in the next round to South of Scotland side Threave Rovers, whose young, talented side blew away Vale. Sam Warren opened the scoring direct from a corner in the 12th minute and Chris Rogerson bagged a hat-trick before Craig Rudd completed the rout in the final minute. This was no fluke result and were it not for some heroics from goalkeeper Iain Gordon, the margin of defeat could well have been greater. Threave went on to defeat local rivals Annan Athletic in the next round to qualify for the Scottish Cup proper where they hosted Forfar Athletic in a second round tie, the SFL club running out 4-0 winners. In the Image Printers Cup, Vale saw off Eyemouth United to set up a Third Round meeting with Preston Athletic. The two sides had met in a League Cup tie the previous year in what was quite a tight game, but there were to be no upsets against Premier Division opposition in this competition, with a Phil Hobbins double and further goals from Remo McCann and Andy Murray more than enough to cancel out Craig Dickson’s early opener. 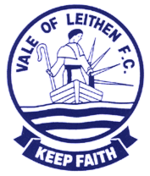 Vale’s league campaign got off to a fair start with victory over Tynecastle and the following fixture against promotion favourites Selkirk saw the Innerleithen side dominate the game, but fail to convert their chances and only come away with a point. Further draws followed against Hawick Royal Albert, Craigroyston and Gala Fairydean, before again getting the better of Eyemouth United in a league fixture. So although Vale went into the new year unbeaten, a combination of cup ties, postponements and the way the fixtures schedule had worked out, meant only six league games had taken place, ensuring that the Innerleithen side were destined to spend the rest of the season playing catch up. An unusually mild January saw all fixtures fulfilled, but the first game of the year saw the unbeaten league run ended with a shocking performance against Tynecastle at Fernieside. The defeat proved too much for co-manager George Watson, who had become increasingly disillusioned with his role within the management structure. Attempts to resolve the situation proved futile and after almost exactly a year at the club, Watson departed. Vale continued the drawing habit against Peebles Rovers and Selkirk, but lost to Craigroyston. The best performance of the season came at Ormiston as goals from Rory Mair and Craig Dickson put Vale two up at half time. David Cheyne pulled a goal back for the home side, but another Mair strike and a late goal from Mark Brown rounded off a good win. Disaster awaited a couple of weeks later as Coldstream visited Victoria Park and left with all three points in another game that highlighted Vale’s inability to turn possession into goals. This left the Innerleithen men’s chances of promotion depending on one of the teams above them to shoot themselves in the foot, and another defeat in the return fixture at Coldstream was a further nail in the coffin before a Selkirk victory at home against Edinburgh Athletic confirmed the Souters in the second promotion spot behind runaway league winners Craigroyston. In the King Cup, Vale fell at the first hurdle against Edinburgh City. As with the Image Printers Cup tie against Preston, Vale took the lead against their Premier Division opponents, only for the Citizens to rattle in four goals. The match was sadly notable for Vale’s influential midfielder Scott Johnston sustaining a broken ankle, which ruled him out for the remainder of the season. Another draw against Edinburgh Athletic at home in the last league game saw the capital side hold on to third spot at the expense of Vale. Although fourth place – achieved with a lower points total – was not a significant improvement from the previous season, there was grounds for optimism as the young side played some great football, with only the lack of a regular goalscorer preventing greater progress. Towards the end of the campaign former Vale and Gala Fairydean player Jocky Taylor returned to the club as assistant manager and as the season ended, there was good news as the majority of the players committed themselves to the club for 2006-07. Having gathered experience during the season and with some new additions to a squad overseen by a united management team, hopes are high that Vale can fulfill their potential and realise their ambition of promotion at the third time of asking next season.